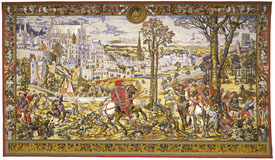 The original of this Maximilian hunting tapestry hangs in the Louvre in Paris, representing the month of March, measures 4.4 by 7.5 meters. The series of 12 tapestries, woven for Archduke Maximilian (afterwards Emperor Maximilian II) after the designs of Pieter Coecke from Aalst and Frans Borremans from Brussels, is showing details from Brussels and from the Zonien-forest. To the right the church of Saint Goedele, now the Saint- Michael cathedral.